Adorable and quirky, who doesn’t love puppies! It’s always an exciting time at home when owners prepare to bring their new furrever friend home. But, new doggie owners can find it quite challenging when it comes to caring for your new puppy. In this article, we’ll cover everything you’ll need to know in order to master the art of puppy care. All puppies are born with blue eyes! Melanocytes are cells that produce pigment. Puppies have immature melanocytes that’s why they are all born with blue eyes. However, as a puppy ages melanin is produced at varying concentration giving your puppy his unique eye color. Puppies should never be separated from their mothers before 8 weeks of age! One study showed that when puppies were separated from their mother at 6 weeks of age, they were a lot smaller and in poor body condition compared to other pups. Puppies love it when you baby talk to them! A study found out that if you talk to a puppy in a high-pitched, slow tempo voice (classic baby talk voice) puppies seem to positively react to this sound. Ever wonder why your puppy keeps turning his head when you talk to him? This is because puppies are trying to understand you! Puppies don’t understand human language so they begin to associate certain commands and gestures in order to understand you. What You Need Before Your Pup Arrives! Puppy food!!! This is very important, you ideally want to get puppy food that will help your pooch grow. It’s highly recommended that owners provide both dry and wet food for their new puppy. Food & Water Bowls: Plastic, ceramic and glass. There are many kinds of bowls available for your first pup. But, our recommendation is a dishwasher safe, lead-free, ceramic bowl. This is because plastic bowls can easily carry a lot of bacteria if it’s not washed on a regular basis. Pet toothbrush & tooth paste: Dental hygiene is crucial in order to prevent dental disease and swollen gums. It’s important to allow your puppy to get used to regular tooth brushing. Toys: toys! Remember, puppies love to chew! Especially when they are teething, Make sure you get soft, gentle teething toys for your puppy. Leashes & collars: Don’t invest in expensive collars and leashes, they’re going to grow out of it! Invest in an adjustable puppy collar and long leash for training. Puppy bedding & containment: Make sure your puppy has a soft, small bed that he can cozy up to. He’s going to be an adventurous little pooch so you might want to invest in doggy crates. Cleaning supplies: Puppies have accidents when they are learning to potty train, this is normal. Make sure you invest in cleaning supplies safe for your pup! Puppy training pads! When you get your first puppy you’ll realize that they are going to be doing their “business” everywhere! This is absolutely normal as your puppy may not be accustomed to the toilet routine. Puppy training pads is a MUST! For any new pet owner currently potty training their puppy. 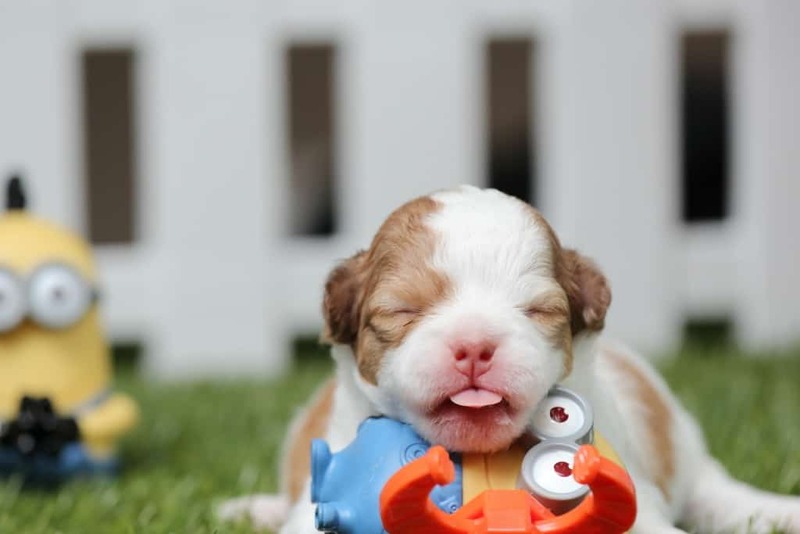 Teething toys: Puppies normally begin teething between the age of 4 months of age. Depending on your puppy’s dog breed and size, puppies can continue teething up until 8 to 9 months of age. So, you need to make sure you have the right teething, chew toys available in order to relief their teething needs. When looking for the appropriate chew toy, make sure it is soft enough to provide relief from pain, it should not be too hard as they can shatter teeth. Ideally, you want to get something like rope toys or rubber kongs and freeze them for a few hours. Freezing toys will provide comfort and relief from your puppies painful gums. Puppies can get into all sorts of trouble. Remember, puppies are born with a poor immune system. It’s important to get your puppy vet checked on a regular basis in order to ensure your puppy remains in good health. Make sure you ask your vet about common puppy problems, puppy vaccination routine and puppy deworming schedules. Now, puppies are born with a poor immune system so you can expect that your puppy may have a few health problems. But, most of these are not a case of emergency. Here we have listed common health problems puppy might face during their first year at home. Diarrhea is quite common among puppies as its often caused by a transition to a solid food diet. Often there are many reasons why a puppy may get diarrhea, to name a few diarrhea can be caused by diet change, food intolerance, parasites, ingestion of inappropriate foods and even stress. Vomiting is another common issues many puppies might face. While there are many causes, the main reasons puppy often vomit is because they may have simply ingested something they shouldn’t have. Think about it! Puppies love to explore and stick their noses into everything they come across. During their teething phase, they may consistently swallow or eat things they shouldn’t like garbage, toilet paper or mud. Is this an emergency? Not necessarily, If your puppy vomits his food once but continues to eat, drink and play normally then this is not an emergency. However, if there are consistent episodes of vomiting and if your puppy seems a little off then this can be serious. Take him to the vet if you suspect your puppy is simply not doing well. Demodectic mange is a form of skin disease caused by a microscopic parasite known as demodex canis. You might have heard of this disease as it is often known as “puppy manage. So, for the most part it is quite common for puppies to get it. It’s important to remember that these microparasites are common among all dogs. As such, once a dog ages these parasites live in on your dog in symbiotic relationship, which means they won’t cause harm. Is this an emergency? It needs to be treated by a vet, but it is not an emergency. Since puppies have a weak immune system demodectic mange can causes problems like hair loss, skin irritation and lesions in puppies. During a puppies teething phase, puppies will lose all their teeth so that their adult (permanent) teeth can settle in. However, sometimes a puppy may lose some of his baby teeth and so this can become quite a big problem. This is because his adult teeth will try to push through, this process in itself can be quite painful for your puppy. A puppy with retained baby teeth might experience bad breath, difficulty eating, inflamed gums, gingivitis and pain. Is this an emergency? No, but it needs to be treated ASAP. While retained teeth is not necessarily considered an emergency, it still needs to be treated by a veterinarian as it is an animal welfare issue. Puppies with retained baby teeth will often require surgery. Puppy vaccination is vital as they will ensure that your puppy receives antibodies capable of fighting disease and viruses. In general, on your first vet visit your puppy will receive vaccinations between 6 to 8 weeks of age. After their first set of vaccinations, your puppy will receive 2 more sets of vaccinations 4 weeks apart. At age 6 to 8 weeks they get set 1 (temporary vaccinations). At age 10 to 12 weeks they will receive set 2, their booster vaccination. At age 14 to 16 weeks they will receive set 3, their final vaccination. What Do Vaccinations Protect Your Puppy For? When you vaccinate your puppy you are essentially providing them with antibodies for a specific antigen (disease). As you continue vaccinating your puppy over the course of a few weeks, you are essentially building up & strengthen their immune system. Puppy Insurance! Do I need it? We believe insurance is very important because you should never have to choose between saving your pet or providing the best health care for your pet over cost! But, ultimately it’s up to you to make the decision for yourself. Feel free to ask us questions about puppy insurance should you have any questions. We are always happy to help you through your puppy journey. The first year with your new puppy can be the most costly year. To give you an idea, we have included a rough estimate on the average cost of owning a pup. Puppy Vaccinations can range anywhere from $60 to $100. Desexing: can cost anywhere from $200-$400 for females. For males, cost can average anywhere from $180-$190. Puppies can sometimes get into a lot of trouble where they may require emergency care. A visit to the emergency room can cost up to thousands in expenses. This is simply because the emergency veterinarian may need to run a series of diagnostic test and conduct a 24 hour hospitalization for your dog. There are many reasons why your puppy may require emergency care, a few common emergency veterinary visits can include; accidental poisoning, gastrointestinal upset, swallowed something indigestible, bloat or car accidents. Puppy School is the Key! The first few months of your puppy’s life is key because this is the time when their more eager to learn and are more likely going to pick up basic commands. Puppy school teaches pet parents how to handle their growing fur-baby! From puppy to adult, dogs are like children. They can be stubborn, naughty and can occasionally have a few accidents. It’s important to only use positive reinforcers towards your pup and never get angry for the mistakes they make. If you need help with potty training then read our article on puppy potty training here. After he gets his vaccinations, it’s highly recommended that owners socialize their puppy with as many dogs, cats, humans and other pets. This will ensure that your puppy remains friendly towards adulthood. puppies are a lifelong commitment, you always want to be prepared when it comes to your puppies health. Make sure you look into getting puppy insurance to protect your pup. Puppies can be a lot of fun, but they are also hard work and expensive little investments. When it comes to puppy care make sure you’re well equipped with the knowledge you need in order to master puppy care! Want to learn more about why socialization is important for dogs? Read our article here. Puppy socialization is key to make sure that you’ll have a confident, happy, energetic, and well-adjusted dog to accompany you for the rest of your life. 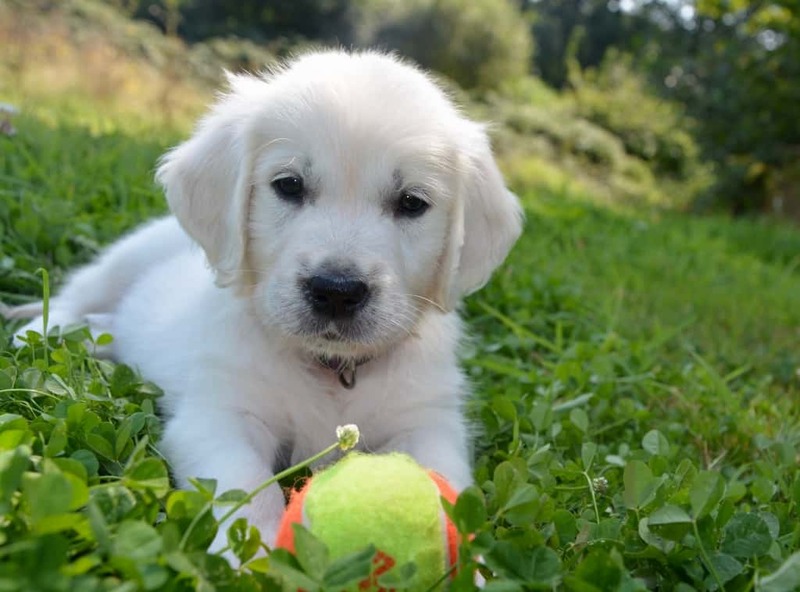 Puppies are particularly open to socialization from seven weeks to four months of age. The experiences they are exposed to during this period will shape their personality, so it is important to do this process right. We have all heard the old saying “fighting like cats and dogs,” but can these two species ever get along? The answer to that is yes, as long as you introduce them to each other properly. Dogs are wired to chase after rapidly moving objects, so keep your eyes on your dog at all times when introducing a kitten to the household. You should have a secluded space in your house where the cat can hide without being bothered by the dog, as this will make both animals feel more at ease. When introducing a cat and a dog, make sure they can see and smell each other without being able to touch. After a little time of getting used to a new companion, you can let them get closer to each other and interact. Keep watch of your pets in the first months of them being together. Sometimes animals may react to things we humans can’t notice and look volatile in the process. Give them time and space to get settled in in their new home dynamics, and before you know it they will be buddies. Dogs can react in a number of undesirable ways to the presence of strangers. Be it by barking, being overly excited or lunging, you can change these reactions to be more friendly and calm. The most important step is to be calm and have your guests be calm too. Dogs are very good at reading body language, so it is important to give off the notion that there is no imminent danger. Having your dog on a leash will also be helpful, especially if he hasn’t been trained yet. Another step you should take is introducing people correctly to your dog by letting them smell their hands. Don’t forget to always give your dog a treat as a reward for good behavior. Dogs are very smart, and with the help of treats will learn to treat guests with respect and love. An important step in making your dog and child get along is to be aware of the unpredictability of their behaviors and know when to intervene. Having your dog trained to obey requests such as “sit,” “leave it,” or “come here” really come in handy. When teaching the dog to be gentle with the child when they’re around, it is crucial that you do it in a comfortable, relaxed, and familiar environment and to not rush anything. Only this way is stress not build up and any progress can be made. It is also important to set ground rules with children. Don’t let them tug any of the dog’s body parts, only let them pet the dog gently, don’t let them approach the puppy while he’s eating, and leave the dog alone while they’re sleeping. When both the child and the dog know to respect one another’s space, their relationship will be much better, and it is likely that they will develop a long-lasting mutually beneficial relationship. How soon after getting a puppy should I take them to the vet? You should take your puppy to the vet as soon as you pick them up from the shelter or breeder. While you can put off the trip to the vet a little if you have a busy schedule, the vet should see the puppy before he’s ten weeks old. The more you wait for your first appointment, the more at risk your pup will be. When should a puppy be able to control their bladder? Depending on how old the puppy is, the amount of time they can hold pee in their bladder varies. In theory, they’re capable of controlling their bladder for a maximum of one hour per month of age. However, this depends from pup to pup, so you should observe yours carefully to try and decide for how long yours can hold their bladder. It is not uncommon, though, for a puppy to need to pee once an hour per two months of age if they’re active around the house and not confined to a carrier. Dogs should have full control of their bladders between the ages of sixteen and twenty-four weeks, meaning between four and six months of age. When can I take my puppy out to dog parks? You should hold off on taking your puppy to the dog park until they have had all their vaccines, so at around sixteen weeks of age. Taking them out earlier puts them at risk for picking up diseases from other older dogs, which is not desirable at all. Dog parks are great places to take a puppy who is being socialized, and contact with other dogs is very healthy and an exciting experience for them too. So as soon as they have all their vaccines, you should take them to the dog park and have fun! How to make a puppy stop crying at night? When puppies cry, it is usually to have their needs met — be it food, water, exercise, or simply company. And being extremely intelligent creatures, puppies can have two kinds of crying: natural, and learned. Learned crying is what they do because their whining has been rewarded in the past, so the first thing you want to do is ignore your puppy when they’re crying and not respond to their whines. A very useful trick is to keep your puppy’s crate or kennel in your room, next to your bed. Being close to a human is usually enough to make them feel safe and secure and to stop crying due to lack of company. After the first week, the crying is very likely to stop if all their needs are met. However, make sure you’re not letting him sleep in your bed in the first few weeks. Your puppy will have to learn that they have a sleeping space and you have another sleeping space. Once he is accustomed to these ground rules, you can cuddle in bed with him. What’s the best food for a puppy? Puppy food has been created specifically for puppies, as they need twice the daily nutritional requirements that mature dogs need. The best kind of meal to give your dog is a mixture of dry and moist puppy food. Dry biscuits are rich in meat proteins, are good for the teeth, and cheap, while moist food is easy to digest, a puppy’s favorite, but can be more expensive. The best brand depends on where you live, but if you stick to either dry food or to a mixture of dry and moist food, your puppy will most likely have his needs met. You should only bathe your puppy regularly when they’re older than twelve weeks. Before this period, the less water the better. To make sure they’re clean simply use a damp towel. If you are using gentle dog shampoo, a weekly bath is recommended. Harsher shampoos will strip the puppy of its essential natural skin oils if you do it as often, but gentle shampoos have been created to avoid this. Depending on the breed and on the size of the dog, teething can last anywhere from eight months to one year. The larger the puppy, the less time it will take for the teething to stop. Have patience, give your dog lots of chewing toys, and understand he’s not chewing through your stuff out of hatred, but rather because of the painfully annoying process teething is. When it comes to obedience training, you have to options: enroll your puppy in a school, or do it yourself. Whichever route you prefer, the point is for your dog to obey your commands. You will see that after going through this education stage it will be much easier to walk your dog, have guests, children, or other animals around the house, and your dog will be calmer and more relaxed overall. If you want to enroll your puppy in a school, there are plenty of them open nowadays. Simply search on the internet for “dog school (your location)” and you’ll probably come across many results. If, on the other hand, you want to teach him yourself, be prepared to have patience, some equipment (a leash and a collar) and to buy treats. This technique focuses on ignoring bad behavior and rewarding good behavior, and it allows the whole family to be present in the education process. A great way to reward your puppy after they have performed a desirable task is to give them a treat and lots of affection. When he does something you don’t like, ignore him and withhold affection and treats. This method is believed to be more effective than punishment, as it works on every dog (even the most fearful and aggressive) and it’s a clear way of sending a message to your dog. You can employ positive reinforcement to teach your dog to do pretty much whatever you like. What can I teach my dog? Using positive reinforcement you can teach your dog a number of things, such as peeing in the designated spots, not pulling the leash when you’re out on a walk, to come back to you if you need him to, and even several party tricks. These are all useful and entertaining things to teach your dog, and this learning process will deepen your emotional connection with each other. When starting to teach your puppy, make sure you’re in a spacious and closed-off space, that you have a leash and a collar ready, and lots of stinky treats and love to give him. Patience, treats and love are a fool-proof way of teaching your dog. Some funny and amusing commands to teach your dog are to kiss, to give you their paw or to shake your hand, to fetch, to roll over, to play dead, to spin, and to hug. The process of teaching them these are the same as for sit, and they’re an adorable trick to show your friends.